Both these districts experience high summer temperatures which lead to disorders in bananas. Carnarvon generally experiences lower winter temperatures but both districts can be susceptible to disorders due to low temperatures. Bunch choking or choke throat occurs when the bunch does not emerge normally from the pseudostem. The distorted and misshapen fruit is unmarketable. It is caused by stresses such as waterlogging, cold, high temperature, water or nutrient shortage. It is common in Carnarvon over winter and varies year to year depending on the severity of winter. Underpeel discolouration develops when bunches are exposed to temperatures below 12ºC and the fruits ripen to a dull grey/yellow colour. This is rarely a problem in the ORIA. Very cold weather (less than 6ºC) at the time of bunch initiation can lead to what is known as November dump fruit. As the name implies, this is a problem with bunches that emerge in November after initiating in the winter. Occasionally a bunch will ‘spit’ out of the side of the pseudostem, often also as a result of ‘choking’. Bunches have hands on which some fruit is poorly developed, twisted and ripens earlier, making maturity hard to gauge and packing even harder. It is more notable after cold winters. In WA bunch loss through peduncle (bunch stem) snap and pseudostem breakage is common. 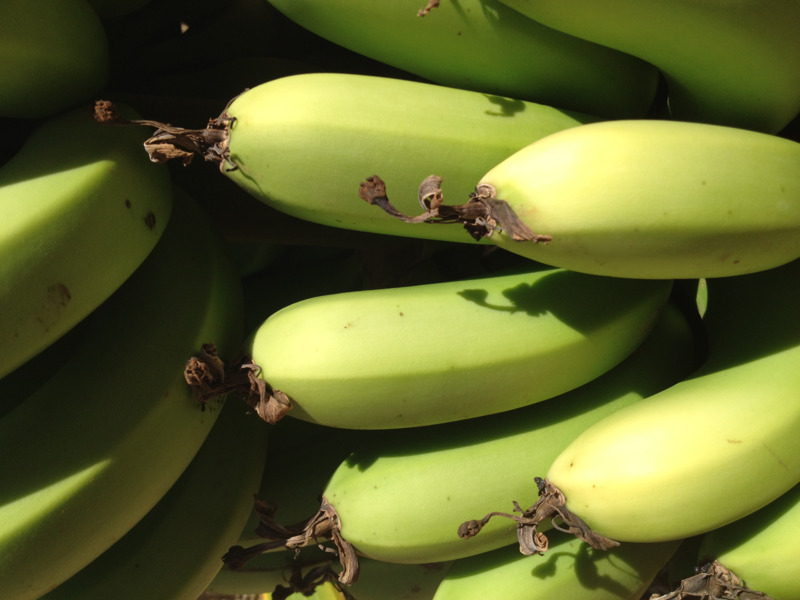 Heaviest losses occur from October to March when strong winds, high temperatures and low humidity cause moisture stress, a factor believed to be responsible for weakening the banana pseudostem. Trials at Gascoyne Research Station showed fewer bunch losses in the parent crop compared with the first ratoon crop. This could be from the disproportionate increase in height and bunch weight relative to girth that occurred with the ratoon crop, making it more susceptible to breakage. A trial in 1990 showed that delayed irrigation and high evaporative demand increased bunch losses. The use of props to support the bunch may reduce the mechanical forces sufficiently to reduce bunch loss. However, this has not been shown by experimental data. High air temperatures, usually above 38ºC, and high solar radiation are associated with sunburn damage on exposed fruit, especially on the top hands of the bunch. If the temperature increases above 40ºC a temporary wilt occurs in which the transpiration demands exceeds the ability of the root system to extract water, leading to bleaching and/or burning on wilted leaves.